How Do You Cure Depression in Children? It's estimated that depression in children exists in 1 out of every 10 children. Is your child suffering? 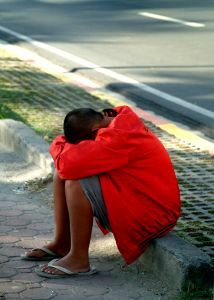 What Are The Symptoms and Behaviors Of Childhood Depression? How Do You Correctly Diagnose It? What Are The Common Treatment Approaches to Treating Childhood Depression? First off, what are the signs of childhood depression? Your Child's Relatives; Perhaps You, the Parent? Studies have shown that close relatives of children with major depression are more likely to suffer from depression. If you've gone through our e-course, you'll learn more about what family habits contribute to depression. A number of brain chemicals, called neurotransmitters, can cause depression if they are not firing correctly due to poor life style habits such as an incomplete diet and little exercise. We live in an age where, for some reason, we parents feel like we have to be busy. We are busy as parents and then we busy our children, enrolling them in every activity. Childhood sports are an example. At a very young age, we sign them up for highly competitive sports. What happened to simple play? Depression in children easily occurs with grief over loss of a pet, loved one, etc. Children need to grieve and talk through their grief. If this is the case with your child, please take her to talk with a children's therapist. Learned helplessness often occurs in children who are raised in harsh social environments where success is difficult to achieve. They suffer motivational losses and are very resistant to training. It's a mental state in which people of all ages feel that they have no control over their failures and that failure is inevitable. Children with learned helplessness typically fail academic subjects, and are less intrinsically motivated than others. They may use learned helplessness as an excuse or a shield to provide self-justification for school failure. Additionally, describing someone as having learned to be helpless can serve as a reason to avoid blaming him or her for the inconveniences experienced. In turn, the student will give up trying to gain respect or advancement through academic performance (Ramirez, Maldonado, Martos, 1992). If depression in children comes from learned helplessness, simply love that child and tell her when she does something good and right! Affirm her positive behaviour! Lack of ability to provide for self-monitoring, self-evaluation and self-encouragement. Negative views of self, the world and one's future. Separation, divorce of parents or even close relatives. Death of a loved one; a person or a pet. A move from one town, or even one neighborhood, to another. Academic, sports or athletic failure. An injury or physical illness resulting in hospitalization or restricted activity. Loss of customary surroundings, family, or close friends. Failure to live up to personal expectations. Repeated physical, emotional or verbal abuse.